Olympus scandal whistleblower Michael Woodford agrees to be photographed on the balcony of his riverside apartment near Tower Bridge. The scene could have been lifted from the opening shots of Dragons’ Den, where TV viewers are treated to a glimpse of a luxury lifestyle earned by high-flying business people. A year ago, however, the picture was far less rosy. The balcony doors were firmly closed. It was a different story. Woodford felt vulnerable, wary of being pictured outside his London bolthole, which offers panoramic views across the Thames. He feared that any photograph exposing the precise whereabouts of the property may heighten any threat from a would-be assassin. The police had, after all, advised him to fit a reinforced front door and seal up his letterbox. And a team of armed officers would be made available on demand, should he need them. At the time, Facta, a respected Japanese financial magazine, had reported that ‘anti-social forces’, aka the country’s deadly ‘yakuza’, may have been on Woodford’s trail. He had fled Japan following a boardroom bust-up which had triggered an ‘eight-minute corporate execution’ and led to Woodford catching the first flight out of Tokyo, as an ex-employee, on 14 October 2011. There has since been no evidence linking the criminal underworld to the now well-publicised accounting scandal, but Woodford admits that exposure of events, and a book he has written about his experiences, have taken their toll. 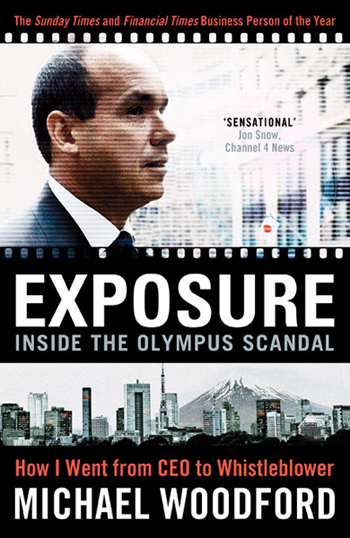 Exposure: Inside The Olympus Scandal is a real-life thriller, in which Woodford gives his account of the £1.1-billion cover-up that wiped more than three-quarters from the value of one of Japan’s top companies at the end of 2011. Helping to uncover, and publicise, corporate wrongdoing threatened his health and almost cost him his family life. The book itself also carried a personal pricetag. The businessman-turned-author ditched initial plans to employ a ghost-writer and chose the more time-consuming option. That meant him having to re-write swathes of text, as lawyers pored over every word for any potential legal fallout after publication. ‘It nearly killed me doing it. I started at the beginning of June – getting up at around five and working straight through to 10 o’clock,’ he tells Amateur Photographer. Writing the book helped Woodford fight off the stress that the drama had put him, and his family, under for many months. Though cathartic, the process also rekindled painful experiences, such as the night-time screams of his Spanish-born wife, Nuncy, who felt immense anxiety in the weeks after the scandal was exposed. ‘We could have broken up,’ says Woodford. ‘But I don’t think that’s unique to us. I think any marriage or couple who suffer extreme emotional [stress]… it doesn’t make you together. It accentuates your differences. That is what happens in those situations. Today, Woodford seems relaxed, fresh from a recent get-away-from-it-all break at a Buddhist temple in his beloved Japan, travelling with his wife. He is also buoyed by positive media reviews of the book, which goes on sale tomorrow ahead of a likely movie deal with Ink Factory Films, a production company that brings the John le Carré spy novels to the silver screen. Woodford has yet to sign up, amid interest in his story from other parties. His book tells the story of how fraudsters masterminded a complex scheme to cover up massive losses which Olympus had racked up on investments, disguising them through a series of multi-million dollar ‘Mickey Mouse’ company acquisitions and a record-breaking $687 million financial fee which, at the time, outside authorities were blind to. Has the money trail gone cold? However, it seems that tracing where all the dirty money went may present an uphill struggle on the scale of Mount Fuji. Much of it found its way to the Cayman Islands. Yet, as FBI and Serious Fraud Office investigations continue, questions remain about where all the funds paid to outside parties ended up – in spite of an Olympus probe led by a former Japanese Supreme Court judge. In September, three of the prime suspects were hauled before a court and admitted accounting fraud, among them Tsuyoshi Kikukawa, former company chairman who accused Woodford of failing to understand Japanese culture after he confronted boardroom colleagues with his findings. Woodford is still bitter about the way Kikukawa treated him. He also resents any suggestion that he, a non-Japanese speaking Brit, was promoted to president and then made CEO in the hope that the cover-up would remain hidden – stressing that he was awarded the top job on the back of his position as a proven business executive. ‘No, it wasn’t to get some sort of quiet person in there. If they had wanted that they would have got [executive vice-president] Hisashi Mori to do it.’ Mori was among those arrested in February. Woodford, a former head of Olympus Europe, already held a track record for blowing the whistle, having alerted his bosses to internal wrong-doing in 2005 and 2008. After being sacked ten days into his new job as CEO Woodford sued for unfair dismissal and sought compensation for the remaining years of his four-year contract. He won £10 million – much of which he plans to donate to a human rights charity, Reprieve, and the kind of road safety campaigns that earned him an MBE 11 years ago. Any suggestion that he is cashing in on the Olympus crisis, he says he would regard as offensive. ‘The thing I care about is the story being told. I am not having T-shirts and merchandising, saying, “Michael is a great guy” type of thing. Woodford has set up charitable trusts and does not believe in ‘inherited wealth’. ‘I give a lot of money away to charity and I will continue to do so. And eventually I will give it all away unless something unforeseen happened with my children. I want them to make their own way. I’m not driven by financial imperatives. 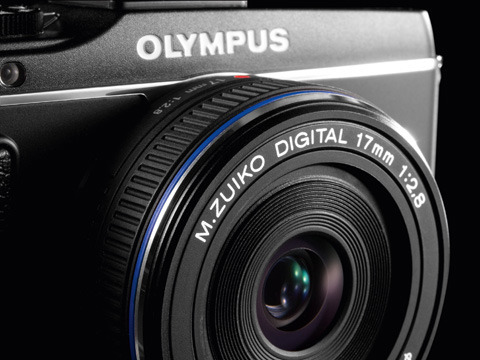 Though Olympus was the focus of his 30-year career, the ousted boss refuses to comment on the business activities of his former employer since his dramatic departure, including the recent capital tie-up with Sony. Woodford makes clear that he has ‘left the stage’, though he wishes his former employer well. He says he still uses an Olympus Pen camera. He points to recent news that the minister of justice in Japan, Keishu Tanaka, resigned because of alleged past links with organised crime. He is heavily critical of the ‘passivity’ of Japanese institutions and the ‘accepting’ nature of the nation’s people, amid reports that the likes of Sony and Panasonic have had their debt ratings cut to ‘junk’ status in recent days. On the consumer electronics industry, he asks: ‘How is this economy going to generate wealth to pay back the deficit, never mind sustain itself? The authorities continue to shirk outside scrutiny, he asserts, citing the lack of hostile takeovers in Japan as adding to the damage. ‘The Olympus scandal has changed absolutely nothing. All it has done is make people outside Japan more informed, more knowledgeable, more wary of the capital markets and the behaviours in Japan. There is no demonstrable evidence of any real change. Despite the negative signs, Woodford seems hooked on Japan, its economy and its people. He lectures on corporate governance to institutions worldwide and is campaigning for independent, and compulsory, hotlines for whistleblowers – staffed by outside lawyers, for example. As others are left to tie up the loose ends – perhaps adding a yet-to-be-written final chapter to the whistleblower’s 250-page account – Woodford’s personal role in exposing the story has reached a full stop. As far as the public is concerned, though, there is a further, unresolved mystery to mull over. Who was the original whistleblower who tipped off journalists at Facta magazine? Woodford is determined to protect the identity of the Facta source, refusing even to say if they are male or female. If that person had not approached Facta, or if Woodford had chosen to go along with the status quo – and not ruffle any corporate feathers – the ex-CEO would have simply served out his four-year contract and no-one would have been any the wiser. Woodford said he developed a bond with the Facta source after a contact organised for the pair to meet discreetly – an experience he describes as ‘humbling’. Woodford’s connections to Japan remain strong on a social level too. ‘I’ve been back twice in October and took a few days holiday with friends to the Noto Peninsula where I stayed in a Buddhist temple. ‘It was kind of amusing. You are meditating for 45 minutes before the chanting, and then you have to clean the temple. It’s very basic but I had a very rewarding few days. The people were lovely and you can get away from these corporate golf-club types.